Natani: What took you so long, Keith? Natani: oh, thanks… What’s wrong? Your ears are all… droopy. Natani: …So Keith. That girl you came in with… she was your ex-fiancée, right? 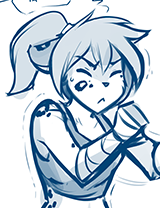 Natani: Do… do you still have feelings for her?